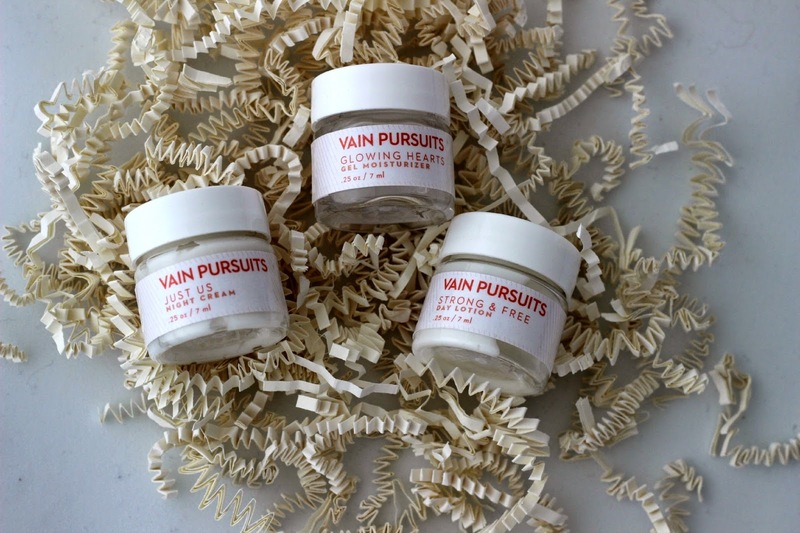 I am so excited to share that Vain Pursuits has officially launched! If you follow me on Instagram, you might have caught my picture that I posted a few weeks back of the samples I got to try out. This brand hits very close to home (literally) - it is based in Montreal, and is the first online skincare service of its kind in Canada. Now, what can make a skincare line so different from others you may ask? 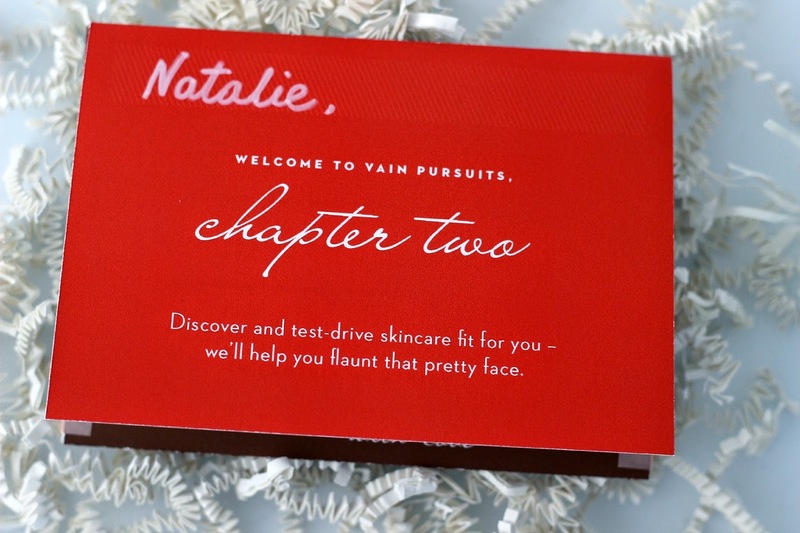 Apart from Vain Pursuits offering all-natural, chemical-free products, they actually create personalized skincare fit for your skin type and preferences when it comes to lotions, creams and gels. That's right: all you have to do is complete your online beauty profile on their website, which basically asks what's your skin type, your age, and your scent and texture preferences when it comes to facial products on a scale from 1 to 10. You will then be matched with your facial fairy godmother, aka your skincare gal pal, who will work her magic and custom-make products that are suited for you. Once you have tried the samples and let your skincare specialist know how you like them, she will then tweak them to your liking and Vain Pursuits will then send you your full size products! After completing my beauty profile on their website, I was sent the Strong & Free Day Lotion*, the Just Us Night Cream* and the Glowing Hearts Gel Moisturizer* samples along with instructions and descriptions for each product. 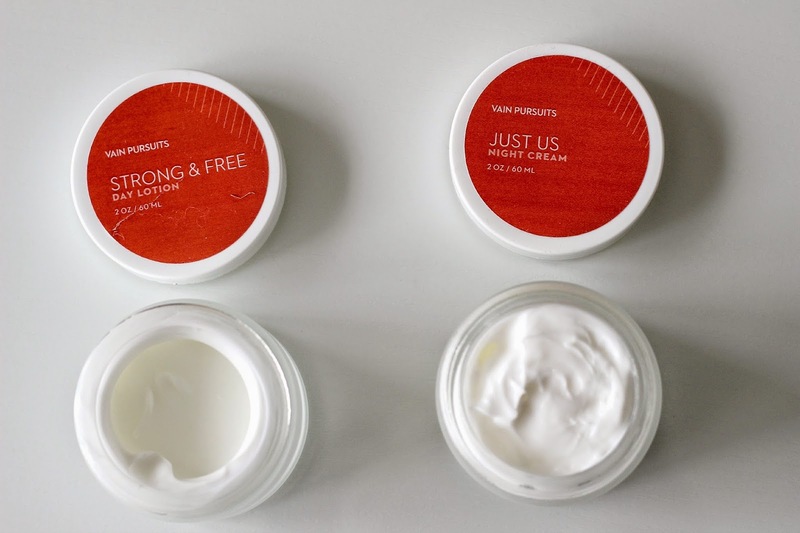 The following day, the lovely Ruby, my skincare confidant, reached out to me to start my new regime by trying out the Just Us Night Cream. Since in my beauty profile I selected to "surprise me with a scent or no scent," Ruby decided to keep this one unscented for me. I also opted for a cream that isn't too thick, and Ruby hit this one spot one - I've been using this cream every night and am absolutely loving the consistency. It looks and feels quite thick, however it takes under 5 minutes to completely sink into my skin. Some of the ingredients include Aloe Leaf Gel, Avocado Seed Oil, Jojoba Seed Oil, Grape Seed Oil, Shea Butter, Olive Leaf Extract, Triglycerides, and Vitamin E. A couple of days later she asked for my feedback and if there was anything I would like to change, and I let her know that it was just perfect for me as is. The next product I tried is the Strong & Free Day Lotion, which Ruby made me start using a few days after trying the Just Us Night Cream. Since I had selected liking scents that are floral, minty, and earthy in my profile, Ruby added lavender, peppermint, and cedar extracts to this one. Although I initially thought I would enjoy a naturally-scented facial product, I realized that the scent was just too overpowering for me. When Ruby contacted me again, I let her know that the cedar scent was too strong for my taste, and she determined it best to keep this lotion unscented for me as well. Apart from the scent, I very much enjoyed the texture of this product. It is definitely more lightweight than the night cream, and I can easily apply it under my makeup since it absorbs in a couple of minutes. The ingredients include Grape Seed Oil, Avocado Oil, Jojoba Seed Oil, Shea Butter, Aloe Leaf Juice, Vitamin C, Vitamin E, and Silk Amino Acids. Ruby then let me know that she was perfecting my products and I received the full size day lotion and night cream earlier this week. They come in glass jars and contain 2 oz or 60 ml of product, so these products will last me quite a while. 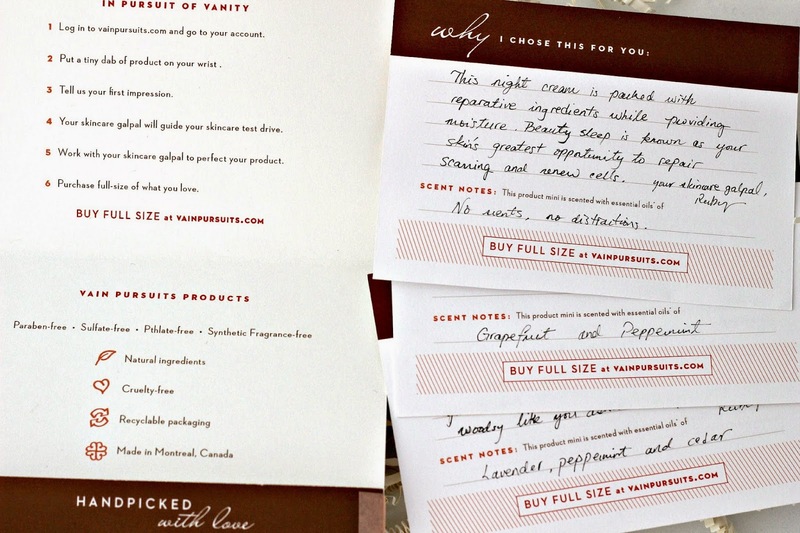 I also received cards for each of the product stating what they are formulated to do as well as their ingredients. Overall, I am super impressed with Vain Pursuits. Right off the bat, I was smitten with the whole concept of having skincare catered to what I like in facial products. All of their products are made in Montreal, Canada and contain natural ingredients, so they are paraben-free, sulfate-free, phtalate-free, synthetic fragrance-free, and also cruelty-free. Everything from the shipping packaging to the products and instructions cards are made of 100% recyclable material, so the team behind Vain Pursuits is very environmentally conscious, which is definitely a breath of fresh air! After testing everything out, I actually really enjoying the whole experience of being "watched over" by a skincare specialist who made sure I was satisfied with the products I was sent by tweaking them until they were just right. Would I recommend trying Vain Pursuits? Absolutely, yes! I certainly wasn't left disappointed, and my skin is feeling very thankful for the clean ingredients! You can also connect with Vain Pursuits on Facebook, Twitter, Instagram and Pinterest! *Disclaimer: These products were sent to me and have been reviewed in accordance with my Disclosure Policy. This post contains affiliate links. Whoa I am going to check this out tomorrow. Thanks so much for sharing! Ah this is a great post. Thank you for sharing.